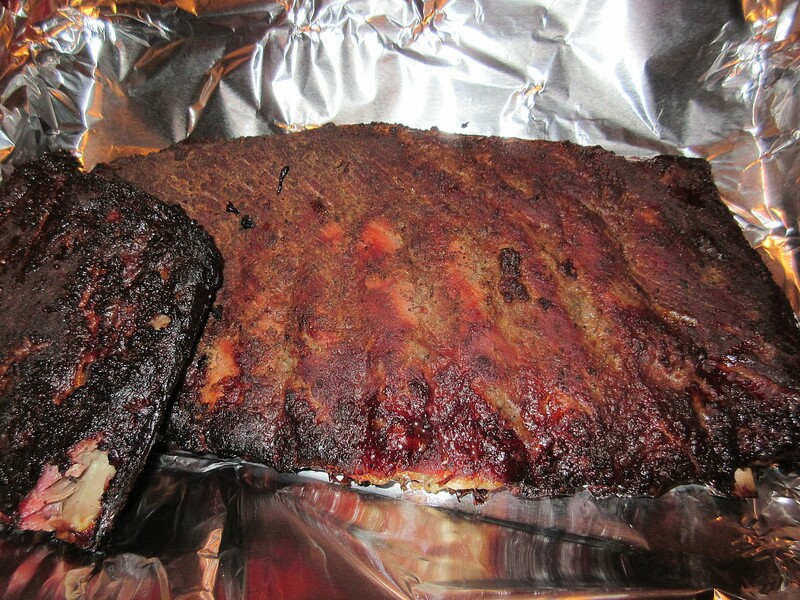 We did the second rack a tad different. First I had to cut the end off because it was too long for our little bullet smoker. I used the same rub and my Mrs ran the smoker for 3 hours. She kept the smoke pouring out for the whole duration. Then we wrapped in foil and finished the last hour in the oven at 250 degrees. 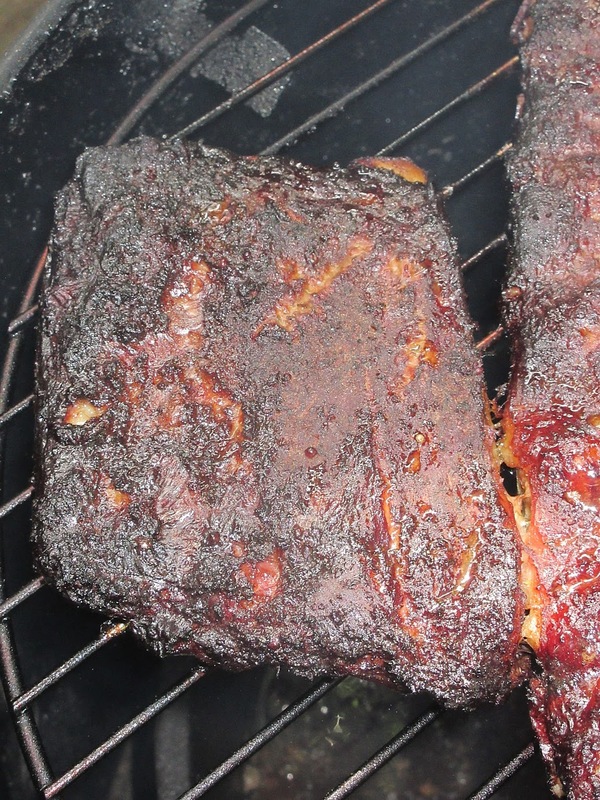 Tenderness and moisture were spot on but the smoke flavor was still minimal. That didn't prevent us from eating them up. We're going to try her secret chicken technique on our next batch of ribs and see if that improves the smoke flavor. 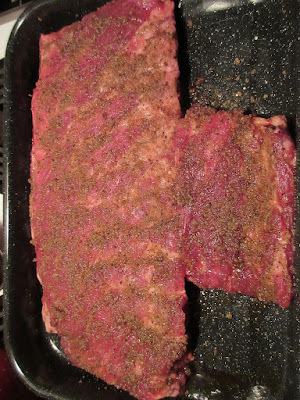 The Mrs spotted some bargain spare ribs on sale so she grabbed a couple of racks for our little bullet smoker. 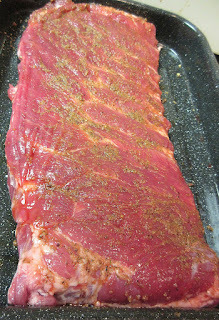 After trimming and removing the membrane, I coated both sides with a little soy sauce and some North Main BBQ All N One seasoning. 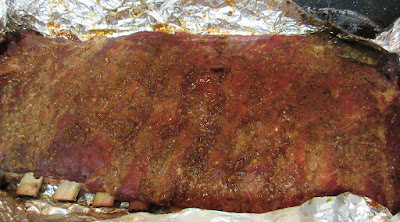 The ribs spent 2 hours on our little smoker, then I wrapped them in foil and they spent another 2 hours in the oven at 275 degrees. 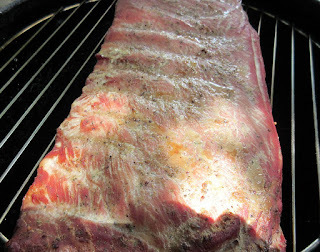 They came out very moist and falling off the bone but no smoke flavor that I could discern. Dang it. We still managed to eat 'em up. We will try again with the second rack this weekend and my wife is going to do her smoke tricks on 'em. I saw several stories on the local news last night about a brisket thief up in Denton. Some idiot pulled up behind Bet the House BBQ, broke into their smoker shed at 4 am, and stole one half-cooked brisket. Then to make matters worse, he left the door to the smoker open causing a grease fire and burning up over $700 worth of meat. Damage to the smoker and shed totaled over $4000. They have some decent video of the moron's car with a bicycle on the back. It shouldn't be too hard to find, so I hope he gets his just desserts to go along with his half-cooked brisket. Here's links to some of the local news stories. You might have to wait for an ad to get to the story.